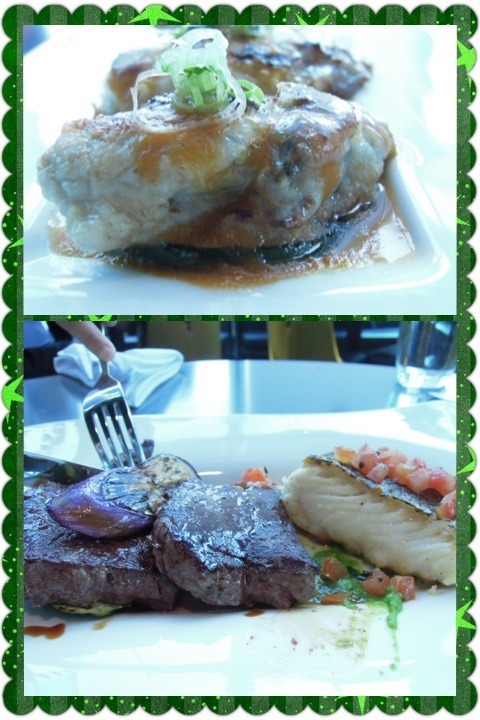 I went to Aqua for the all-you-can-eat brunch one Sunday. 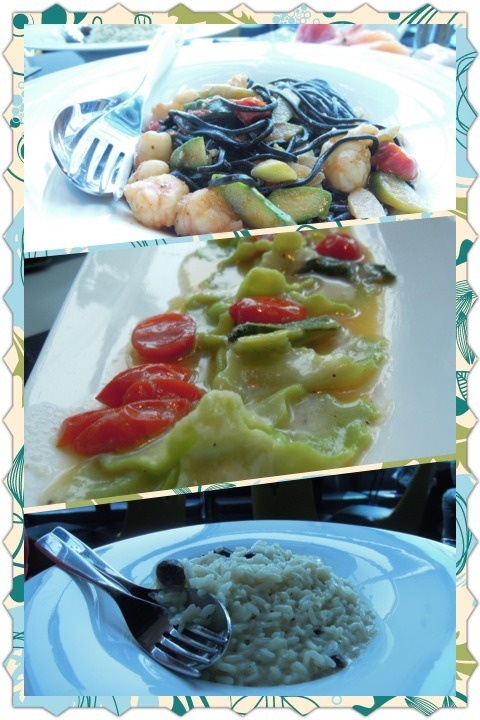 The restaurant is situated on One Peking Road and has an absolutely breathtaking seaview. On the day I went, it was sunny and summery, which made the experience and scenery all the more stunning! Aqua serves contemporary Japanese and Italian food. Even though the Aqua Group restaurants (e.g. La Marmite and Wasabisabi) are, in general, known more for their service and décor than for the quality of their food, which means that I had low expectations to start with, I still found the cuisine rather mediocre. For the all-you-can-eat brunch ($688 + 10% with unlimited champagne, $488 + 10% without champagne), you can order unlimited starters, which are quite filling, and then choose one pasta and one main course per person. 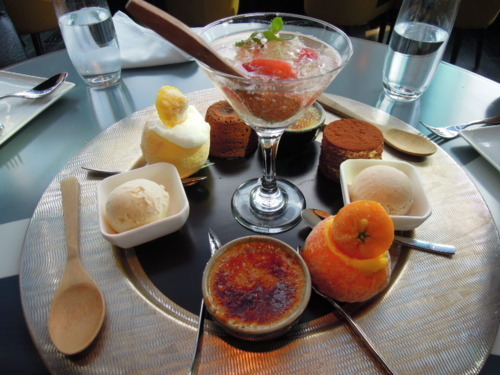 The table will get a dessert platter to share at the end of the meal. (1) The Sushi & Sashimi was fresh and delicious. 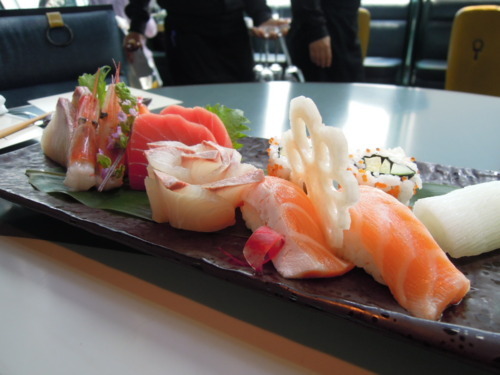 A random selection is served to you and you don’t get to request for a particular type of sushi or sashimi. While this arrangement is perfectly understandable given that starters are unlimited, the lack of choice made us feel a bit unsatisfied somehow. 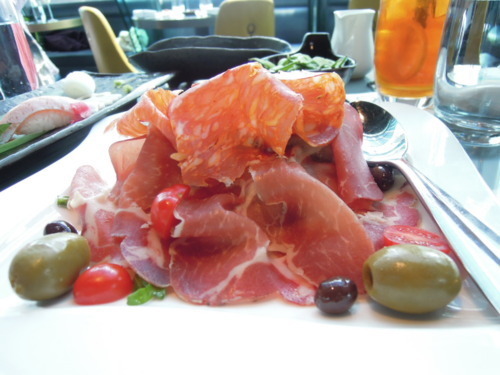 (2) For the Italian starters, there was the Antipasto Platter, which was a ham platter. It wasn’t exactly commendable, and lacked the Italian goodness that you can so easily find in ham platters at other restaurants! (3) The Pasta Section and the Mains were probably the best part of the meal. The Home made squid ink tagliolini pasta with prawn and green asparagus had an awesome combination of flavours, and the Ricotta ravioli with cherry tomatoes and basil was beautifully stuffed with cheese and had just the right tastes. The underdog, though, was the classic risotto with mushrooms, which was bland and not cheesy enough. (5) Taste aside, the Dessert Platter looked incredibly adorable and inviting! The champagne jelly in soda water was really refreshing and remarkable, as I don’t often see this on other dessert menus in Hong Kong. The ice creams and sorbets were nice and fruity, but the cakes were average and the tiramisu wasn’t particularly creamy or enticing.